Monday again, which means new batch of challenges. First one I've managed to complete is Papertake Weekly one which this week is 'making waves' - to use either scallops or zig zags in your card. Well, I was half way through making this and it has scallops, so that was nice and easy! 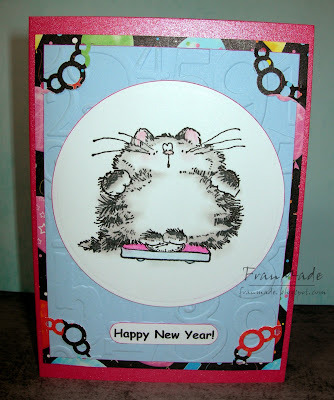 Images: Mice and sentiment from 'Party Critters' Penny Black They've done a few of these now where they have taken some of their old wooden stamps and shrunk them into 1 acrylic set which is great space/money wise and I quite like the fact they are smaller. However, I think this set is even smaller then their last 2 so they are dinky! So great for the smaller sized cards. Actually didn't use my prismas for a change but a cheap set of pearlescent watercolours I got from 'The Works' for £2.99 and am quite impressed by the shimmer (can't tell from photo) Added pink stickles to cake. 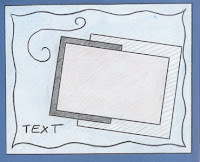 Card blank: is printed precut from a DCWV set I've had for a while now and am trying to use. I think I know why I haven't used them as I like my matting and layering and these last 2 cards I've made just look too flat to me but they are good for quick cards. 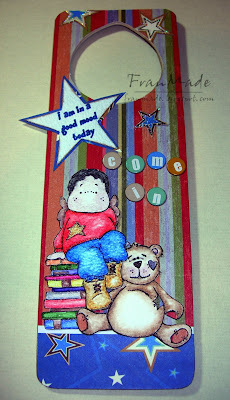 Ribbon and star brads from stash.
. .My addiction to stamps that is. I just can't resist them, especially cute ones! This one's Andrea's fault!! I have been holding out on getting the new Penny Black ones but then they all started coming into stock in the UK shops and then Andrea mentioned she got hers and that was it, the temptation was too great LOL. 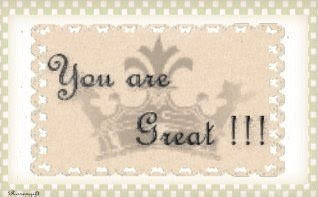 Especially with service like Happy Stampers, ordered Friday afternoon, arrived Saturday! So, here's a quick card using 1 of them (yes, as if I'd only get 1 :D), been refreshing not having to do loads of layers, just a patterned card blank, the image cut with my nesties and some ribbon and gems. Have a good Sunday, the sun is out and, dare I say, it feels a tiny bit like spring! Hope your resolve is stronger than mine, but if not, join the club! 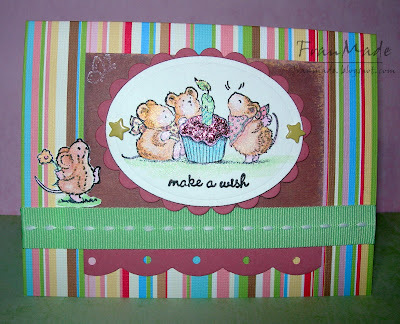 Back to cute. . .
. . . well, ugly/cute as I've used one of my new Magnolia goblin stamps. Hubby says they are ugly but I think they're kinda cute. Think these goblin stamps are a bit like Marmite, you either love 'em or hate 'em! 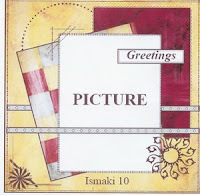 Not much to say about this one really, as it was a quick folder card I needed to send some images in for one of the candy winners over on Tilda and Friends ATC blog. You'll know if it's you when you get this on Mon/Tues! Sorry, it's nothing spectacular but I had limited time last night and wanted to finish it to catch the post. Coloured with Prismas/Sansodor and a bit of Sakura stardust pens for her jewellary and ribbons (and clear glaze pen on her teeth!). Added some gems from my stash and the card is a basic folder card tied with ribbon, sentiment hand written and cut with SU word window punch. That's it really! Hope the recipient likes it, if not the card, then the images in it! It's another foul day here, grey and tipping with rain again. perfect for me to stay in and craft until I have to go to work tonight. Hope you're all making the most of this miserable day and don't forget, for all us UK girlies, we lose an hour's sleep tonight :( , clocks 'spring' forward an hour. Well, on the plus side, at least we'll get a bit more daylight now, hopefully! . . .I won Marlene's blog candy, how cool is that?!! Totally forgot about it. Her son chose the winner, and it's his birthday today so THANK YOU JAKE & HAPPY BIRTHDAY!!! got to dash, off to work, one very happy bunny! 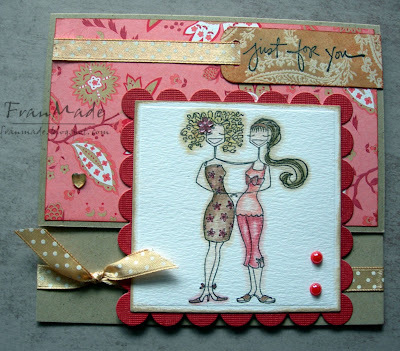 PTW challenge this week was to use a sketch set by the fabby Katharina (her creations are amazing). 1. I got 2 of the new quickcutz revolution dies, the long 12" borders ones (flourish & scallop) earlier this week. Don't know about you, but had to try it out the day I got it. So I've had sitting on my desk since Tues, a flourish strip in purple and a scallop edge in white. Decided the purple flourish would be good for the central strip in the sketch and the scallop one would be the one going across it. 2. Got the new Laura Ashley's papers this week, so looked through those for something with a bit of purple in it which would be the background. found a nice creamy yellow floral one. Only now my flourish is too bright a shade of purple so have to tone that down with an inkpad. 3. Wanted to use the stamps that I got with it too. So chose the bird as the main image then tried to put it all together as per the sketch. 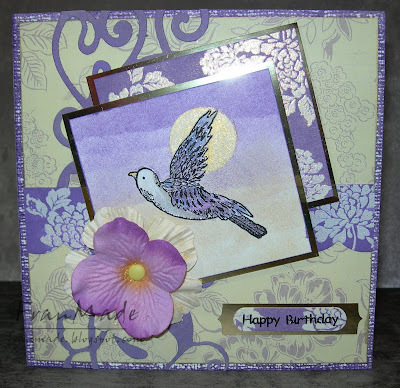 4. find it's a bit flat and need more purple but I don't have a coordinating piece of paper that I like so end up stamping and embossing over the white scallop diecut with a flower stamp and inking it purple and a matching bigger piece to go behind the bird. The bird which I have now masked and created a sun and sky scene with. 5.and so it goes until I end up with this and it took far longer than I planned! Probably bored you to tears but just wondered if anyone else starts with wanting to use 1 thing and then it grows and changes until it's completely different to that vague idea you had. In this case it was supposed to be quick and easy. Not. Although it was fun to go back to basics and make my own background for a change just don't like the mess left behind afterward (desk looks like a bomb hit it), must be why I don't do it that often. The latest issue of 'cardmaking & papercraft' mag had article of how to make your own crochet flowers. Well, I've seen the ones that you can buy and I did always say to myself that if you knew how to crochet they would take minutes as my big Sis crochets and I know how easy the flowers are compared to what she comes up with. Anyway, along with lots of other things that I buy to try but never get round to, I knew I had some crochet needles and yarn knocking around somewhere so I dug those out yesterday and gave it a go! Obviously not that great but if I can find some prettier colour yarns and a bit more practice I think I've cracked it. They do literally take 5mins to make 1 too. 'Paris Tilda', fence, tulip grass and snail all Magnolia stamps. 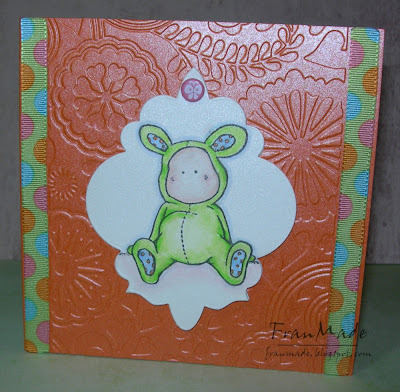 Snail stamped seperately and stuck on everything else done by masking & stamping over Tilda. Blue chalk background for sky. Used my Prismas & stardust pens as usual but whilst digging around found some pearl ex pigments which have hardly every been used and thought I could use those in lieu of twinkling H2Os. IRL it does add a sheen and sparkle which you can't see in photo (added to hat, ribbons and shoes). Added stickles to the tulips and glossy accent to snail shell. Paper: actually made myself use a sheet from one of my BG pads LOL. this one is from 'Boxer'. Rest: Image matted and layered with my rectangle nestabilities, SU 'lots of thoughts' for the sentiment punched out with SU word window punch. Then 2 of my experimental crochet flowers added with brad from stash! Must be getting old, the weeks seem to fly by, can't believe it's Thursday already. Which means time for a new CCT theme this week is people. 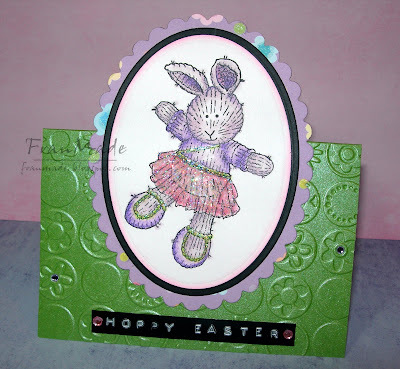 There's more blog candy up for grabs again this week, hop on over for details and for all the other fab DT cards. Decided to give my Tildas a break and use one of my neglected Bella stamps. Went for a kickstand card as it's a little bit different but still nice and easy to make. ATC theme this week is colours of the swedish flag (blue & yellow), home of Magnolia. 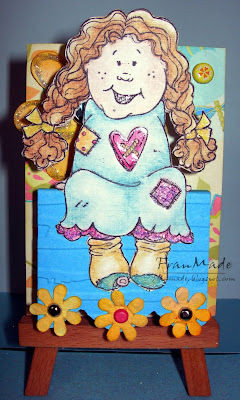 I used one of my new goblin stamps, Martha. I know some people think they are ugly but to me, they look very cute once coloured in and I find, like the Tildas they grow on you, the more you look at them! Images: Rubber Romance stamp, love this one & only used her once before so thought she deserved another inking. Added clear glaze to the bedposts and phone to give them a sheen but can't see in photo. Her top is sparkly too. Happy Hellos is a SU set. Image: 'Nellie with Puppy' stamp coloured with Prismas/Sansodor with stardust pens on Nellies jewellary and flowers on jeans. Her top is paperpierced. Others: Numbers cuttlebug embossing folder used for the beige strip across the card then dabbed pink chalk ink over raised bits. 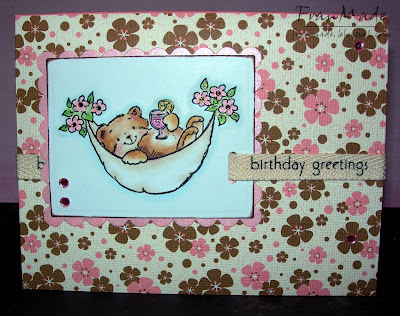 small Happy birthday embossing folder used in corner of card. Brads, flowers and pearl gems from stash. Added pawprint in versamark ink in top right corner as I thought it looked a bit bare and thought this was quite cute. Hope it's been a good Easter for everyone as I think the weather's not helping with all the colds and bugs flying around at the moment. It's been snowing lightly today but nothing major, just a very cold Easter. Didn't stop me from popping out for a craft fix (well, no post today is there?!). Dovecraft's got new range of Laura Ashley papers and stamps out so some of them ended up coming home with me as they are lurvely :D. As with a lot of my papers/stamps I'll end up looking/hoarding them for a bit before I actually get round to using them! 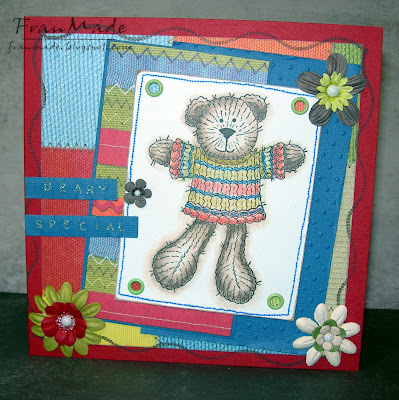 Image: bear stamp from LCR range at Funky kits. coloured with prisms/sansodor. Went over the line by accident when I was blending so rather than cut him out I tried Marlene's trick and blended the colours over the line on purpose and she's right, it does look quite good. Will do it on purpose next time, thanks Marlene! Wavy stitching round the edge of paper is a stamp from HOTP set. Hope you're all having a good Easter. No cards to show I'm afraid, woke up with a headache today and just not been in the mood! Hopfully will feel like making something later. 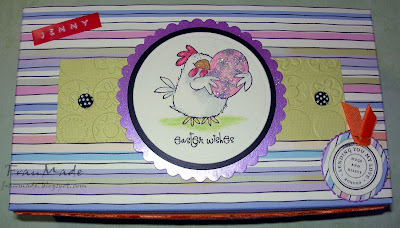 Maybe if I do my DT ATC for next week's Tilda challenge it may inspire me to make something else. Here's an award I got given by Vicki and Jo. Thanks girls! The "Arte Y Pico" (Art & More) is given to bloggers who share their art and creativity making their contribution to the blogger world. I'm supposed to pass this on to 5 others but as usual I see far too many great blogs (more than I have actually got round to listing on my sidebar as most are on my pc 'favourites' and too long for me to transfer over!) so this is to everyone who I visit and to all who visit me. Oh and Jo, re. the other thing you tagged me with, I've done that before, sort of, so I'll give it a miss if you don't mind (and yes, I was stuffing my face but not with choc - just made myself some crabmeat & sweetcorn soup :D)! Don't think I'm interesting enough to think up 7 more 'random/weird facts' LOL. Four jobs I have had in my life: Waitress, 'project management/admin' type job during placement year at Uni (too long ago for me to even remember my actual job title lol), Merchandiser, managing a take-away business. Four places I have lived: Hong Kong (born there), Sheffield(met hubby at Uni there), London, Wirral (Hoylake, Moreton). Four places I've been to: Barcelona, Italy (Rome/Venice/Sorento - honeymoon), Crete, Amsterdam. Four of my favorite foods: Chinese (surprised?! Roast Duck & Char siu my all time favourite followed closely by crispy duck), Sushi, Roast Lamb & yorkshire pudding, smokey bbq Ribs. four's not enough!! Four places I'd rather be: home, anywhere with my hubby, back to the Almalfi coast in Italy, all the other places I've yet to visit/go on holiday to including US (stash heaven). No challenge cards today although these could qualify for this weeks CCT challenge too. 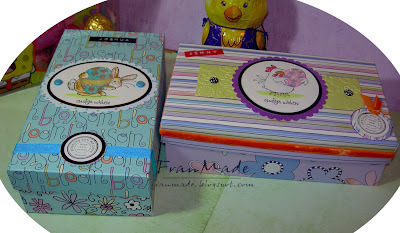 They are 2 boxes I made yesterday to put some easter goodies in for my niece & nephew who live across the road! Here are the close up of the lids, again fairly quick, just some Penny Black stamps coloured my usual way but also used glossy accents with glamour dust sprinkled over it on the egss. Like I did on my previous card as I loved the effect so much. It really gives it a 3d look (which you can't tell from photo) and super sparkly look. Cut and layered images with my nestabilities. Circle sentiment from SU 'circle of friendship' set and their names printed with Dymo. 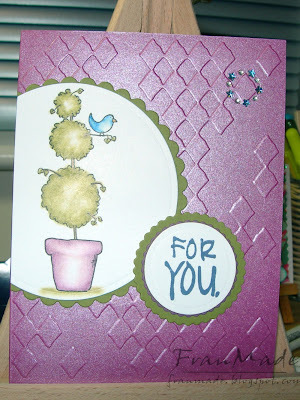 What a fantastic response to the first challenge over on Cute Card Thursday, so many cute cards out there! Thank you to everyone who took part and hope you'll all play along this week. Paper: DCWV mat stack and scrap piece of green cardstock. Was going to mat it straight but decided offset looked better. PTW challenge this week is weather: So anything associated with the weather - whatever your interpretation! Under the weather, fun in the sun? Wind? Rain? Let's see what you can come up with lol! For some reason I got this mixed up with the tilda challenge so looked for a Magnolia stamp (think it was card overload for me today LOL). 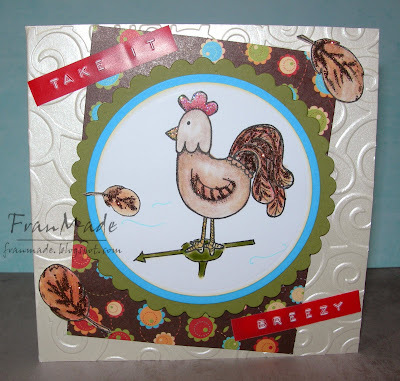 I didn't want to use my windy Tilda and don't have the rainy but then inspiration struck when I picked up the hen stamp. Had to use this tilda again otherwise she's going to be redundant for another 12 months plus she is so cute and I love colouring her in! Used Nicola's sketch over on My paperworld. Others: Pearlescent card blank embossed with cuttlebug folder. Sentiment made with my Dymo and added few gems to finish. This week's Magnolia ATC theme is chocolate, be it just the colour or the edible variety. 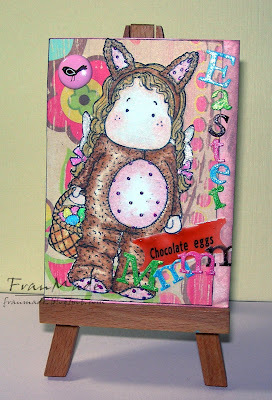 Seeing as it's Easter this weekend, chocolate eggs just came to mind and it was just the excuse I needed to use my Bunny Tilda :). Alphabet stickers, scrap PP and brad from stash. Tilda just cut out and coloured with Prismas and stuck on top! This weeks theme over on the Magnolia challenge is ' hidden secrets' Must have a hidden message on your project ,perhaps pull out journaling maybe? A hidden flap? A slider , something where a message can be hidden away from the public eye. 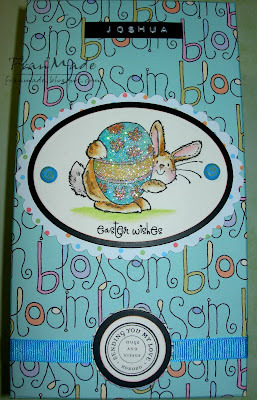 Image: 'Bunnykins' magnolia stamp on a cuttlebug 'tagalicious' diecut tag cut out twice. Attached with brad. 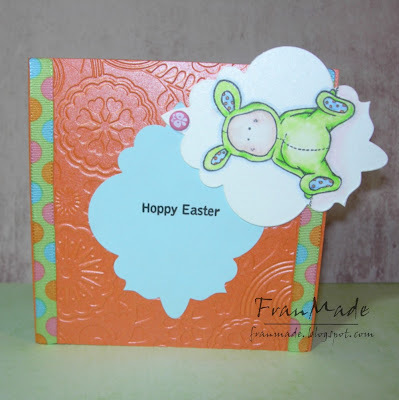 Sentiment from Pink Cat Studio's Easter set. Others: orange precut card embossed with cuttlebug folder and 2 strips of ribbon added to the sides. Finally finished a card for Marlene's 'green & ribbon' Challenge (you should go look here, fabulous candy prize on offer) and also fits into this weeks Daring Cardmakers 'teen spirit' theme. It's a slider card which I thought was perfect for this image, corner photo shows it shut and the main one when open. Inspirational Blog & another Award! 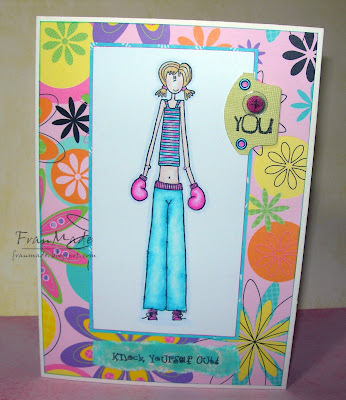 Just wanted to thank Andrea for featuring my frame card on the Inspirational Blog. This is what it says on there . .This blog has been created to showcase creations from around the world that myself and the team find inspirational. You should go and have a look as there are loads of amazing creations on there, it sure made me happy to be there amongst such lovely pieces of work. All Images are Magnolia stamps (apart from 'home sweet home' which was printed off pc) coloured with prismas. Used sakura glaze pens on all the windows and doors of the houses so they reflect IRL, stickles glue in centre of flowers and all over sun (find 'stardust' is fab for a more clear silvery sparkle- the flowers, but 'rhinestone' stickles is fab for when you want a more golden sparkle like for the sun here and for the centre of the sunflower for my Ismaki card this week). Tried stippling my own cloud and grass background with chalk ink and a paper mask and it turned out o.k I think. Birdie stuck and dangled off a bit of metallic thread. Only patterned paper used was for the inside edges of frame and is what I based my colour palette around. The thing that took the longest besides deciding where everything should go was cutting around the fence! Here are some cards I've made and sent out to people over the past month or so but forgot to post after they were received. All fairly simple, coloured with my faves, Prisma pencils and sansodor. but I still didn't quite follow it 100% as the picture I chose was more square and the 2nd ribbon across it just didn't look right, but it's close enough I think! 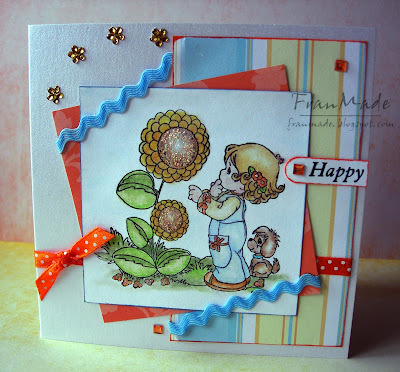 Image: Precious moments stamp from Stampendous (these are an old discontinued range but some are on Ebay I think) coloured as usual plus some stickles in centre of sunflowers. 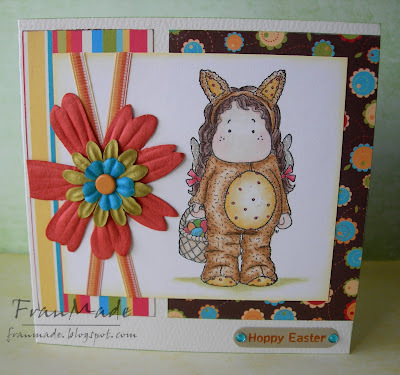 It's Thursday so that means it's time for the first ever challenge over on Cute Card Thursday! The theme is new beginnings or 1st's. This could be new baby, new home,new job, wedding or anything else 'new' or any other 1st you can think of. I didn't really need any new baby or new home cards but then I saw this stamp of mine and just to show you how my brain works I thought 'fat cat on scales = diet time = new year'!! So made this (obviously for someone NOT sensitive about their figure/weight)! 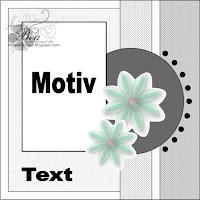 Background: black patterned paper (dovecraft pack) corners punched with 'bubbles' corner punch from EK Success. Really love this punch so need to try and use it more! Blue cardstock embossed with cuttlebug numbers folder. 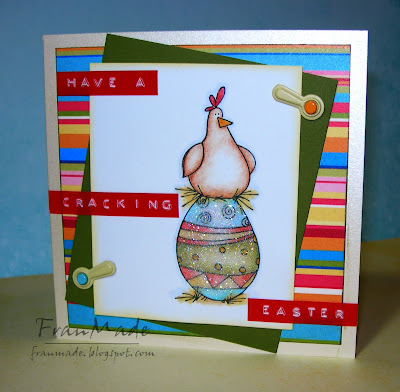 If you like cute cards why don't you enter, all entries will be put into draw for some fab blog candy too this week, so pop on over here, check out all the other DT's interpretation of the theme and join in the fun. Spent most of this afternoon printing, cutting (amazing how useful my crafty stuff is! used nesties to cut circles else don't know how I'd off done them!) and ironing on logos onto some new work uniform. My bright idea of saving money but at least it's out of the way now! So after that needed to do something fun so went back to my door sign and finished the reverse side. Ended up colouring a few more Magnolias (the cuter ones!) just can't help myself! Was going to sit Edwin on 2 piles of books but got bored of colouring the books and looked for something else - sitting on a teddy would be something my nephew would! Again, should be able to click on photo for close up. Others: wording printed off pc and cut out star using free stencil off mag. Chipboard alpha circles from papermania 'masculine' tin set. Cut out some stars from the paper and added stickles for glitter. PTW: be there or be square! DCM: I am Woman. . .